Enjoy a day of maritime delights on this day trip from Perth to Fremantle, a historic port town just south of the city, across the Swan River. 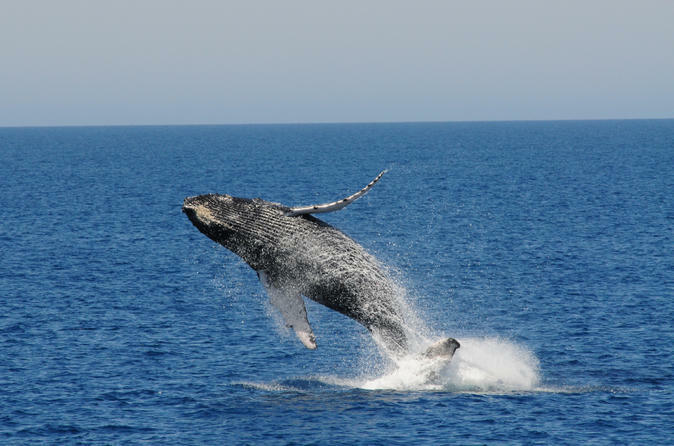 Start with a cruise down the river to Fremantle, where you’ll take off on a whale-watching cruise on the Indian Ocean. As you watch for humpback whales during their annual migration, learn about them from a knowledgeable guide. Then return to Fremantle for free time to explore its heritage landmarks and hopping cafe scene before returning to Perth by river cruise. Morning hotel transfers available from Perth city, Fremantle and Scarborough locations. Your day trip starts in central Perth, where you’ll catch your cruise for a lovely trip down the Swan River to Fremantle, located where the river meets the Indian Ocean. Along the way, admire the leafy Perth suburbs and yacht clubs that line the river. When you reach Freo, as it’s known to locals, hop aboard the custom-built whale-watching boat for your 2-hour cruise along the Humpback Highway, a stretch of the Indian Ocean where more than 35,000 whales and their calves make their migration each year to the Antarctic. Listen to expert narration provided by an onboard guide while you keep watch for the whales from the boat’s viewing decks, and feel free to ask any questions you have. Your cruise ends with return to Fremantle, where you have most of the afternoon to explore independently. Check out the historical buildings, shops and galleries, waterfront, a brewery and many sidewalk cafes that make up this lively town, a favorite local destination. Then return to Perth the way you came, with the boat ride back up the Swan River. You can choose to join us from Fremantle (if selected). This option will exclude the Swan River Cruise component of this itinerary. Whale guarantee: In the unlikely event that whales are not spotted, you are entitled to one free whale-watching tour within the same season.